The RSA 2018 security conference kicked off yesterday and will run until Friday, so there may be greater than the usual volume of info-sec related news this week. Intel had some ideas to share under the umbrella of Intel Threat Detection Technology (Intel TDT), a set of silicon-level capabilities that will help the ecosystem detect new classes of threats. Furthermore, it outlined Intel Security Essentials, a framework that standardizes the built-in security features across Intel processors. Intel has worked closely with Microsoft and Cisco to enable Intel TDT. 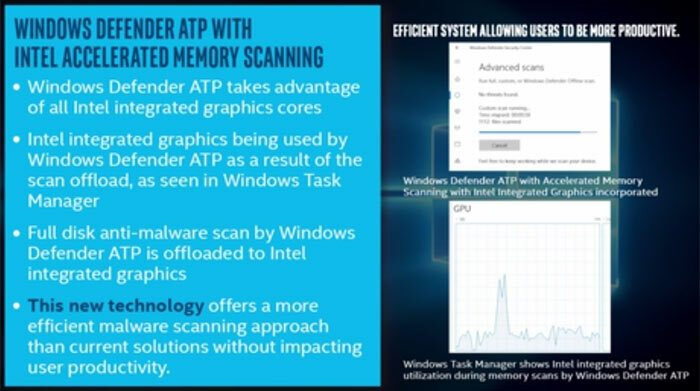 Microsoft has already integrated Accelerated Memory Scanning into Microsoft Windows Defender Advanced Threat Protection’s (ATP) antivirus capability, available now. 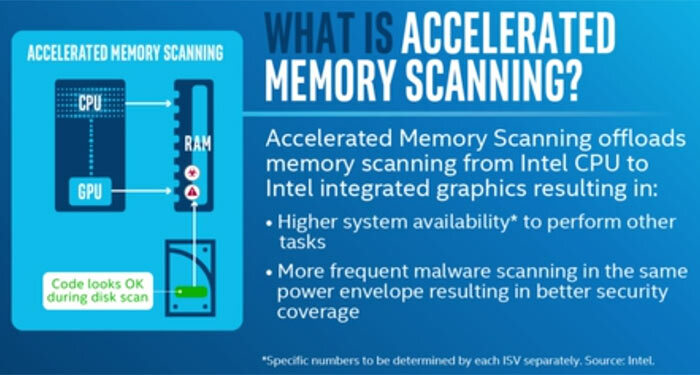 Advanced Memory Scanning detects system memory-based cyber attacks with very low CPU cost, and using less energy, as it leverages Intel iGPUs. In early benchmarks on Intel test systems show CPU utilisation dropped from 20 per cent to as little as 2 per cent. The Intel TDT security enhancements require a system with a 6th, 7th, or 8th generation Intel processor for iGPU acceleration. Intel is redesigning its processor hardware so that the software patches to mitigate Spectre type attacks won’t be needed anymore. Some of the upcoming silicon changes are detailed in the latest Intel blog and pages specific to the Intel Security Essentials framework, linked above. Intel Security Essentials will “ensure a consistent set of critical root-of-trust hardware security capabilities across Intel Core, Intel Xeon and Intel Atom processors,” we are told. This will ensure the integrity of Intel’s secure boot, hardware protections (for data, keys and other digital assets), accelerated cryptography and trusted execution enclaves. As Intel Security Essentials will be integrated into silicon they will have minimal impact on processor performance, according to the chipmaker. Would have been nicer to lock the stable door before the horse has bolted……no I'm not buying a new “fixed” CPU…. WHAT AN ADVERT! So this is simply ‘Open CL’ in disguise? and why cant Microsoft use any other Open-CL supported hardware from AMD and Nvidia.